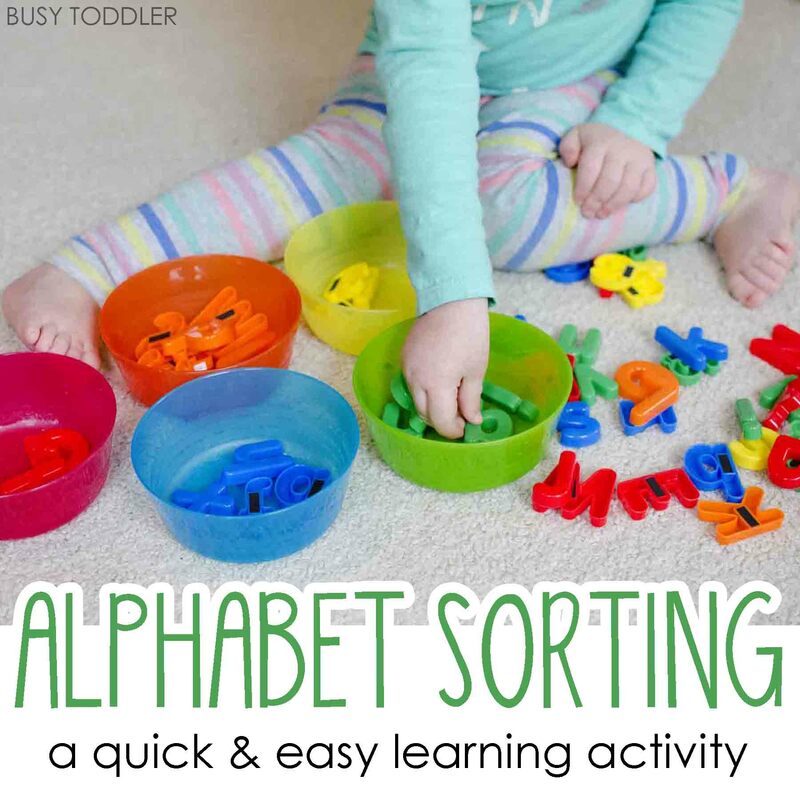 Let’s get our alphabet sorting on! Trying to do sitting activities with my daughter is sometimes like pulling teeth. She doesn’t want to sit, following directions isn’t her forte, and she wants to do her own thing. It’s like she’s a toddler. But of course, it’s all fine by me. She’s 25 months old. It just means that whenever I find an activity that she grabs her… I break out the trumpets because hallelujah! 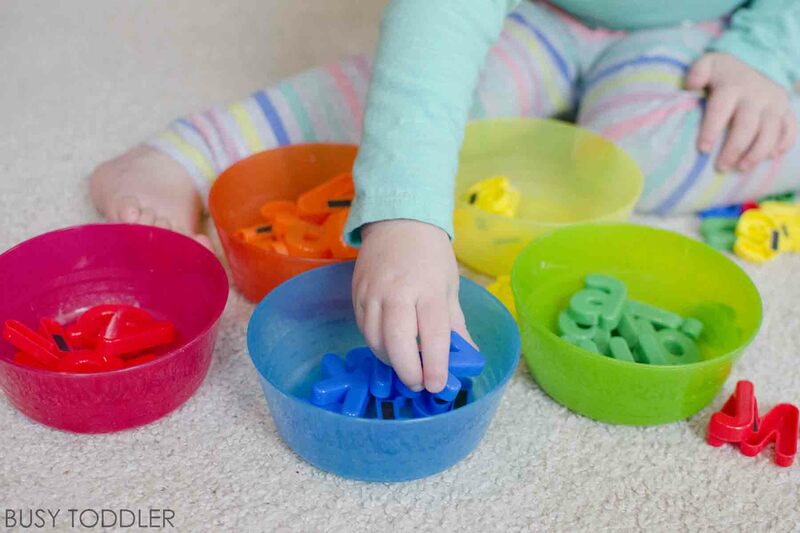 We have a winner on our hands .with this alphabet sorting activity. 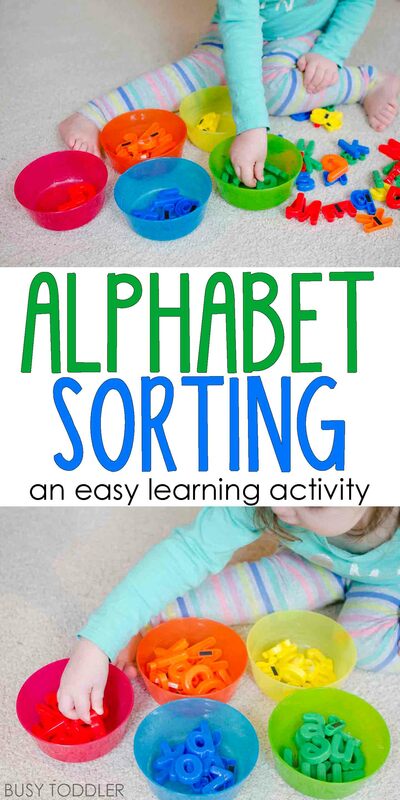 Putting together this sorting activity was super easy, which is always what I’m looking for. I don’t have time to prep an activity for much more than 5 minutes. I’m guessing you don’t either. I also want to make sure I get a legit “return of investment” in my activities meaning I’m looking for my kids to play for at least twice as long as it took me to make the activity. That’s my bottom line. Good news: this activity had an amazing return of investment! Wait until you see how long my daughter played for! 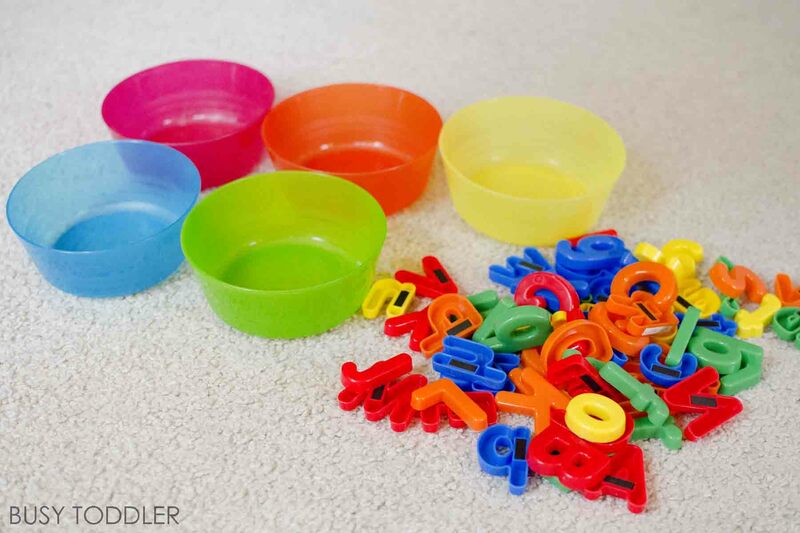 I grabbed out our favorite alphabet magnets – we seriously love this set so much – as the base for our sorting activity. 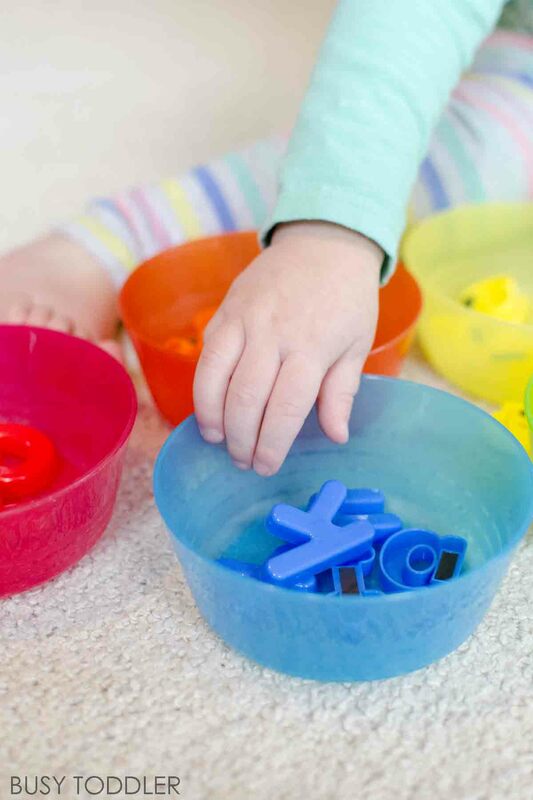 I love sorting activities – they have so much bang for their buck! 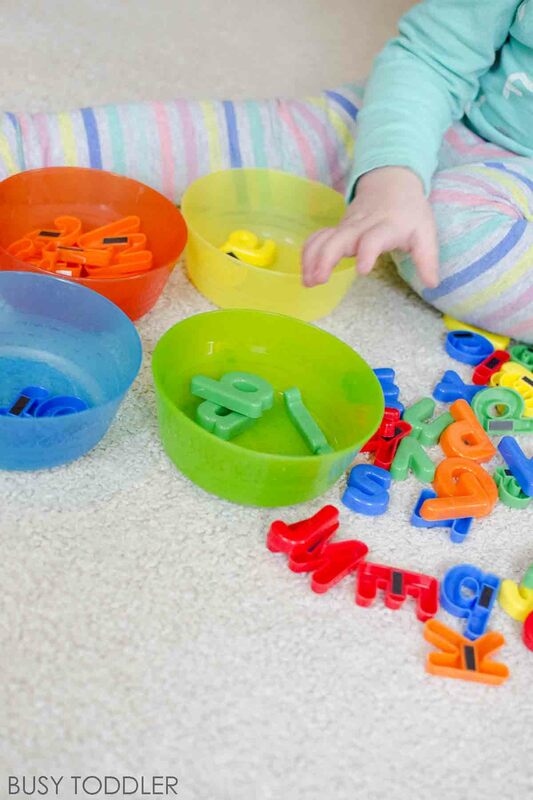 Do you know everything a toddler is learning when they sort? I couldn’t believe how many times she did this activity! My daughter sat sorting and playing for well over 15 minutes which meant the Hallelujah chorus was singing in the background and the sun was shining on me. I couldn’t believe how well this held her attention! She loved sorting the magnets by color and calling out the letters she knew. She’d also ask about the letters she didn’t know so it was a great chance to learn/see some new ones. 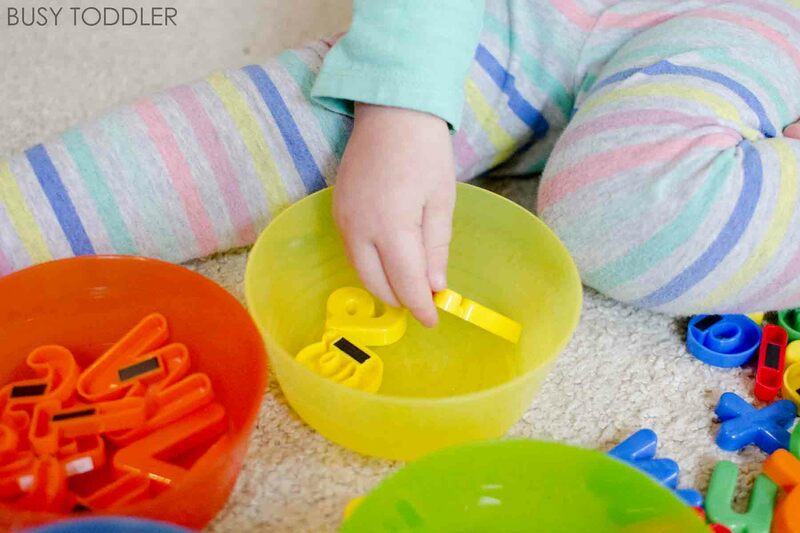 When she finished sorting the first time, she immediately dumped the bowls and started again. Wait, what? My daughter was so hooked she stayed around for more?! Not only that, she stayed around and started the activity over again THREE more times. I should have bought a lottery ticket. Getting a 25 month old interested in any activity can be a bit like herding cats, but every now and then lightning strikes and you find something that really blows them away. 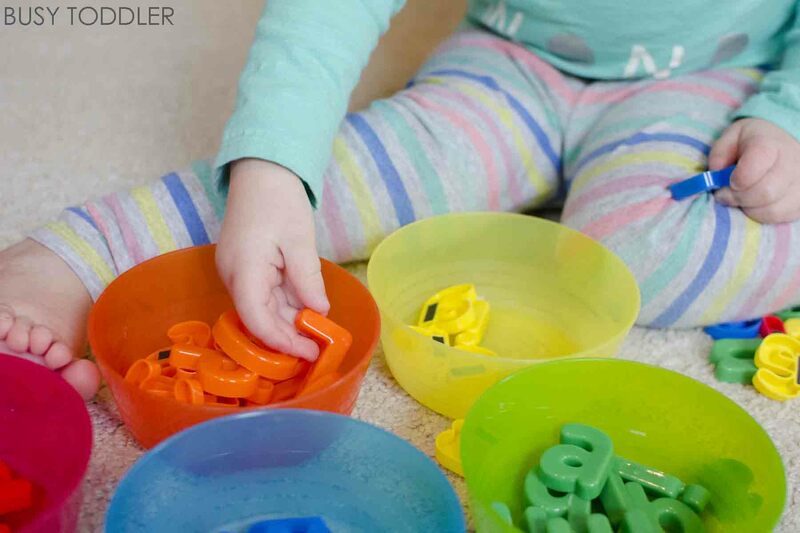 This alphabet sorting activity had me singing hymns of praise for how much my toddler loved it. Think your toddler would be as interested?